I knew I had to get a move on today and get some k’s in regardless of weather. Taking a zero day yesterday was worth it I reckon. Yesterdays rain bucketed down from early morning into the early afternoon. I’m not sure how many mm worth but more than enough to justify spending an entire day drench, tackling what is talked up as a very muddy, rooty, steep track. I was off by 6:15am and made quick work of the 9km road walk to Herekino Saddle and getting to the start of the Herekino Track around 8:00am. This is the first DOC managed track on the Te Araroa and with it the first signs indicating estimated timings to complete the track. DOC’s estimate was 8 hours to Diggers Road. I was keen to see how long it would take me, not to race the time, but to gauge how my normal pace would stack up against the estimate. I would know if I was walking slow if it took me the whole 8 hours. As it turns out I got through in 6.5 hours. Now the Herekino Track has been talked up on many blogs as an being extremely muddy, difficult track. But in completing the whole track I would have to say there is probably a fair amount of euro/american centric views being put into those writings. As it turns out, yeah there is some mud, and some quite long sections, but nothing higher than the ankles. I have had a fair apprenticeship in rack sack sports, particularly bushwalking/hiking/tramper, call it what you will; and if you want to see mud, head to the south west of Tasmania. Now that is mud! So all in all Herekino wasn’t that bad in my arrogant opinion. I will say this though, the description of the last steep descent to the farmland was accurate – easily 35 degrees or more, rooty, and nice red clay making for perfect slippage under foot. The highlight of the track had to be walking through the grove of the majestic kauri trees. Huge girths and towering trunks punching to the sky to spread out a mop of thick upper canopy branches, covered in ferns and moss. These trees were once widespread but are now rare and protected. Past logging of these beasts has seen their decline. 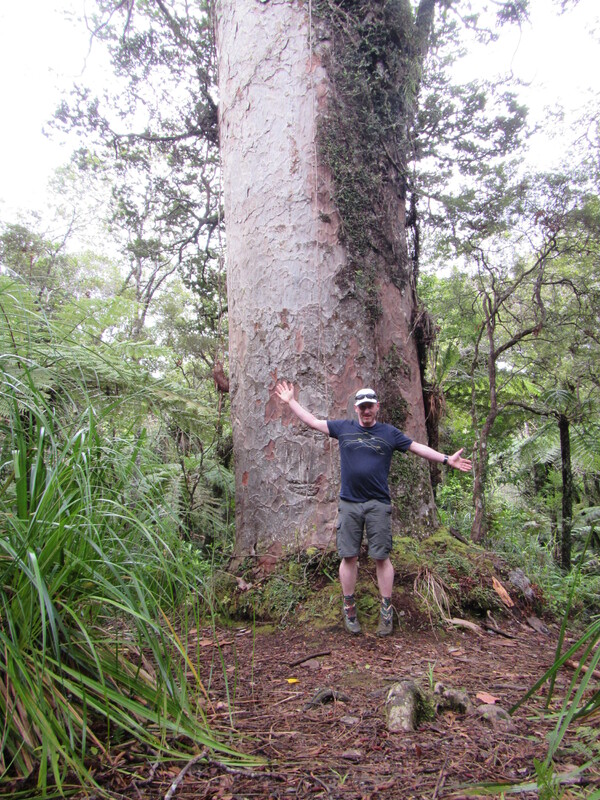 The kauri has a similar history to the huon pine of Tasmania. Now protected, their wood is extremely valuable and is used for fine furnishings and craft. And similar to the huon, most kauri is reclaimed from under water or peat bogs these days, no harvesting. Following the end of the Herekino I was at a bit of a loss of what to do. Too early camp at 2:15pm or so and plenty of daylight left to make up some lost ground from yesterdays day off, so I kept walking. And walking. And walking. Before I knew it I was in Takaune but there is no where to camp. It’s all farm land with fences right up both side of the road, so no where really to just crash. So I kept on going trying to fine a stop to camp. 5 o’clock comes, still no where; 5:30 nowhere. It was around 6pm that I’d had enough. I needed to find a piece of flat ground fast, to stop for the day, set up camp and get some tucker in. I spied a what looked to be an abandoned driveway. There were gates, but they were open, well rusted and the track had no signs of any recent traffic. Walking another 200m on I found was I was looking for on the side of the old track and that was end of my day. I’m in the middle of nowhere and I have reception! Love this photo. You should be writing travel books.